Tadi Brothers’ 7" Monitor and a 120° Mounted trailer RV Backup Camera (RV Backup System) will change the way you drive your RV. Use your camera while driving or in reverse to see easily spot everything in your path. Plus, you can toggle between two cameras at once to maximize your range. The dual purpose monitor can even be used to watch DVDs and play video games, which is always appreciated when traveling with children. The 7" Monitor and a 120° Mounted RV trailer Backup Camera (RV Backup System) is 100% weatherproof, so you won’t have to worry about taking it down during rain, snow, sleet or other adverse conditions. In fact, the camera is housed in rugged die-cast aluminum, allowing it to even withstand hits from rocks. Installing this camera on top of your RV is easy, meaning you’ll be ready to hit the open road in no time at all. Tadi Brothers is proud to offer a high-quality, cost effective camera to keep you safe on the open road. 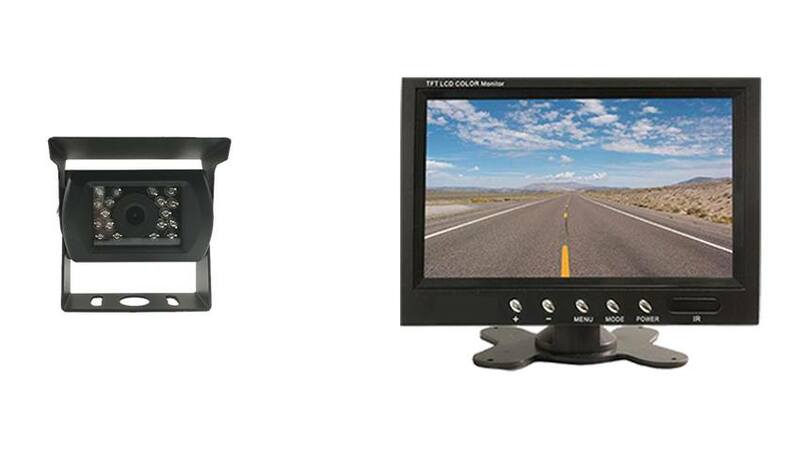 Purchase your 7" Monitor and a 120° Mounted RV Backup Camera (RV Backup System) today! Tadi Brothers’ camera systems are each designed to meet your individual driving habits and needs. Our easily adjustable cameras independently move to create the perfect angle for viewing your surroundings - that way you don’t miss a thing. With other benefits such as mirrored imaging, automatic night vision, and easy operation, this backup camera will meet multiple needs. Built with a rugged die-cast aluminum housing for extra durability, this backup camera is by far the toughest we have created. It is able to maintain functionality during torrential rains and even withstand direct hits with rocks. This item includes a 15 Foot cable, if its going on an RV, Trailer, BUS or any other vehicle longer than average SUV we recommend upgrading to our premium extension cables located on the top right of the page. Is this a color cam and monitor? Can this system be used for full time monitoring of a towed vehicle or only while in reverse gear? Why extra long cables if the system is wireless? Yes it can be. Just connect the power of the camera to a constant power source. The cables give you the opportunity to hardwire the system if you would like.